The party bus St Petersburg service that we offer is highly reputed in this area. The limo buses we provide will help you get a ride for your group and turn your ride into an entertainment zone. Whether you want to indulge in video games on the move or turn the ride into a night club lounge, we provide all the facilities that you dream of. Make your reservation now, call 813-514-6980! 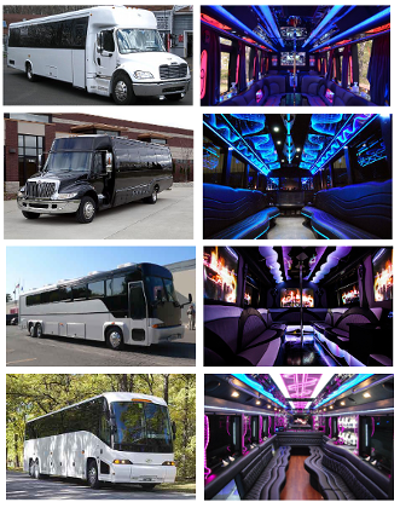 There are 20 passenger party buses to look at from our party bus rental St Petersburg and more. As a result, you will be spoiled for choice whether you are looking to host guests to your wedding venue or are taking your friends out for a bachelorette party ride. An ordinary birthday can be made into an unforgettable one with the kind of party ride we offer. The booking of our party bus St Petersburg service is an easy one. All you need to do is book online at our site. That will ensure that you get to choose among the 30 passenger party buses to hire and choose the seating capacity as well as luxury amenities that they come with. Every bus is a chauffeured vehicle which is convenient for outsiders who are new to St Petersburg. Once you have made a booking on our portal, the ride will pick you up at the appointed time and date. You can even make a booking through our call center numbers. Get our current pricing and availability, just call us at 813-514-6980! Fort De Soto Park; an area with a white beach and an old fort worth seeing. Tropicana Field; baseball games can be watched here. Fine Arts Museum; antiques and fine art exhibits can be found here, which would interest art lovers. Sunken Gardens; enjoy wildlife with botanical beauty. The airport shuttle service for picking up and dropping off travelers to the Tampa International airport or other destinations is important. For those who are arranging for a corporate group pickup and drop or are operating private tours, opt for one of the 40 passenger party buses that we offer and have peace of mind regarding travel. There are several towns and cities in and around St Petersburg like Gulfport, Palm Harbor, Tampa, Safety Harbor, Bradenton, Clearwater, Egypt Lake Leto, Seminole, Palmetto, and Plant City. For those who are traveling to and from this place and need to undergo a long road journey, one of the 50 passenger party buses that we provide through our party bus rental St Petersburg service will come of use.